WELCOME TO CHALSTON HOTEL – SURROUNDED BY AN IMMACULATE, LUSH GARDEN ALL THE WAY TO THE BEACH. Air conditioning, LCD television, 24 hours hot/cold water, refrigerator and safe deposit boxes are available in all Cottages. Air conditioning, LCD television, 24 hours hot/cold water, refrigerator and safe deposit boxes are available in all rooms. We have garden cottages and beach garden cottages. Both cottage types are constituted of one big independent room away from the main building. The garden cottages are situated a little further behind in the property and beach garden cottages are situated in the garden that reaches out to the Calangute beach. 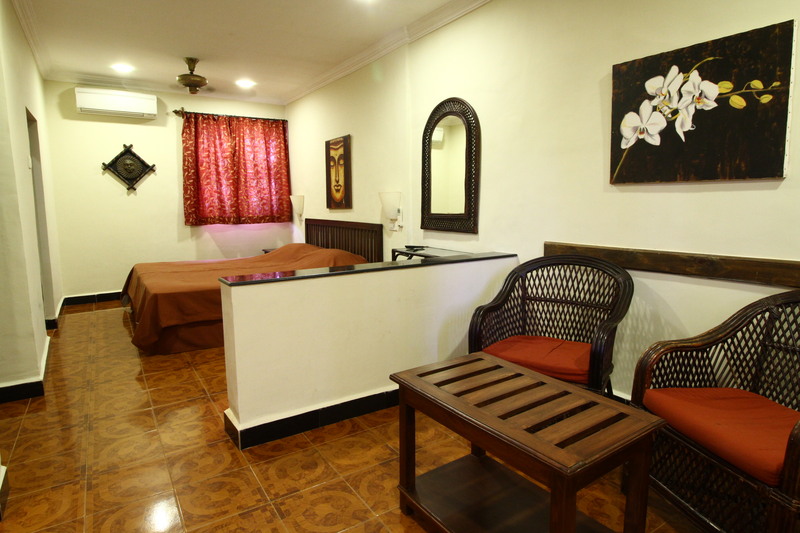 Our property has over a hundred rooms spread out within 3 room categories. Our standard rooms, large standard rooms and superior rooms. Most of the rooms have a view over our lush and expansive gardens while some have swimming pool views or sea view. All our rooms have the required amenities. Please note that while the amenities in all room categories are the same, rooms within the same category may vary in size, decor and view. Photos depicted are sample pictures.